Home PARLIAMENT OMO-AGEGE: WHERE IS URHOBO MANDATE? 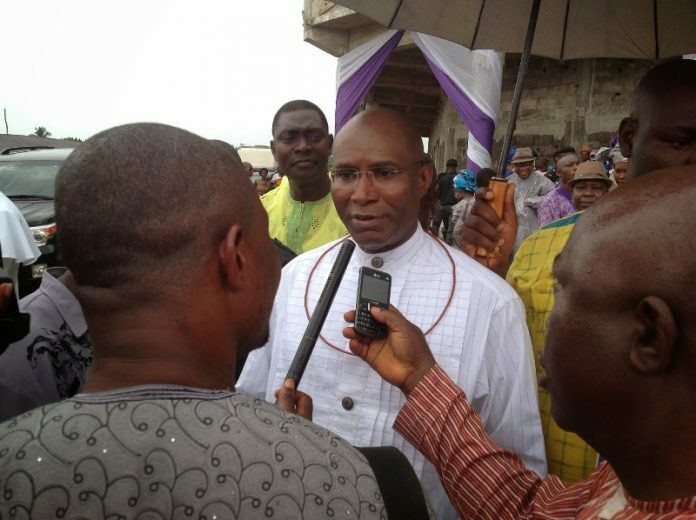 OMO-AGEGE: WHERE IS URHOBO MANDATE? Life is really full of lamentation. Little wonder the book of lamentations captured it this way when it noted… how solitary the city was, full of people and how she became a widow. She that was great among the nations; and princess among the province; how she has become tributary. Similarly, the book of Ecclesiastes described life as vanity upon vanity which it notes was all vanity. The thing that has been, that which shall be and that which is done is that shall be done and there is no new thing under the sun (Eccl. 1:9). As the world is becoming smaller, Nigeria and of course Delta Central as part of it is becoming so minute. Activities of the ‘then and now’ are two opposite poles. The Delta Central of Bar. Akpor Ewherido, the sojourn of Ighoyota Amori in the senate and that of ours today are antagonistic of trio. If the representation of Bar. Akpor Ewherido brought 60% people oriented legislative development to Delta Central, and Ighoyota Amori should upgrade it to 80% during his sojourn in the House, where he brought almost all Nigeria senators to Delta Central was a pointer that Amori was out for serious business and it was the expectation of the good people of Urhobo nation that his successor or robber should do better. Before now, Mr. Augustine Ovie Omo-agege was aclaimed to be God sent occasioned by his pretence to be humble and as someone who is closer to the people, would ameliorate the plights of the people through massive people oriented laws favourable, but what went wrong? How does our mandate went into oblivion in Abuja? In his first two years in office, he pretended to be who he was not, painting Ighoyota Amori to be enemy of Urhobos among other Urhobo patriots, who has paid their dues in Urhobo land. Being overzealous as he is, before his eventual suspension, he was said to be brimming stones and fire within the political party that brought him to power. Mr. Omo-agege was said to have told Otega Emerhor pointblank that he was now the leader of the party in the district, a development that spark off mixed reactions among party members. Omo-agege was alleged to have sponsored some members of his political party to endorsed Great Ogboru as sole candidate governorship of the All Progressive Congress in Delta State, a move that was highly rebuffed in Abraka in attempt to endorse Ogboru in the said meeting. Omo-agege’s plan was to ride on Ogboru back come 2019. Since then among other dubious activities of his made party faithfuls to be uncomfortable with him. Instead of Mr. Omo-agege to build bridges among party faithfuls, or even concentrate on his legislative business, he bought his way to, he was busy casting aspirations on Urhobos, and knocking horns with those he perceived to be enemies. I was in sober yesterday, seeing my representative at the senate being booted out of plenary with 90 days suspension, trying to be more Catholic than the Pope and overzealousness to be in the good book of the Presidency. Omo-agege was said to have bite more than what he could shew, thinking that the red Chambers was Urhobo land where he can insult people and usurp power and go free. And I asked myself, who bewitched Urhobo? Was this the son of a noble Chief Judge? Why can’t Omo-agege maintain the integrity of Justice Omo-agege of blessed memory? Well, some of the answers to the above questions find expression to the kind of person Ovie Omo-agege is made of, few years after the people are already fed up with him occasioned by his empty promises, vague decisions and subtle deeds. Truth is like a water prove, if buried remains the same. Of course it behooves on Urhobos to elect Urhobo patriot to represent us at the National Assembly come 2019, with Omo-agege representing Urhobo at the senate, it seems Urhobos are caused. What is unveiling at the moment is a pointer that Mr. Omo-agege bought his way to the senate against the wish of Urhobos, they could not cry more than the bereaved, but have to endure what they could not cure, but it seems that God and the gods of Urhobo is on revenge. Omo-agege why did you decide to disgrace Urhobos this way! It is so unfortunate that Omo-agege has brought our name to ridicule; I know Urhobos will not forget you in hurry. Omo-agege! Thank you for disgracing us, may God bless you. I suggest that the site administrator should endeavour to improve the quality of articles submitted for publication. I feel that if the web master of this site had read the publication of Kparobo Ehvwubare, he/she would have either trashed it in the bin or thrown it back at his face for its atrocious structure, syntax and grammar.